In my blog “Heroes,” I openly confessed to being a Trekkie. I have seen every episode, of every season, of every series, multiple times. I don’t actually consider Star Trek science fiction; I consider it a blueprint for the future of mankind. So, it should not be a surprise that when NASA announced the space shuttle Enterprise would be flying over Manhattan, that I was determined to get the perfect photograph. This was made easier by the fact that the flight plan showed the Enterprise would in fact be flying right past my building… three times. It’s as if the cosmos were speaking directly to me and ensuring that I could get the perfect photograph. I heard the cosmos loud and clear and was willing to change my schedule in any way that was needed to capture the perfect photograph of this historic event. The Enterprise was originally scheduled to make its fly-by on Monday, April 23, 2012. I adjusted my schedule so that I could camp out on the roof of my building all morning. Then, due to weather, the fly-by was cancelled. The same thing happened on Wednesday, April 25, 2012. Finally, on Friday, April 27, 2012, the Enterprise, atop a specially retrofitted Boeing 747, left Washington D.C. Dulles Airport en route to New York. I watched the Enterprise take off from Dulles live on cnn.com, then started my countdown knowing it would take about 40 minutes for the Enterprise to arrive in New York City. 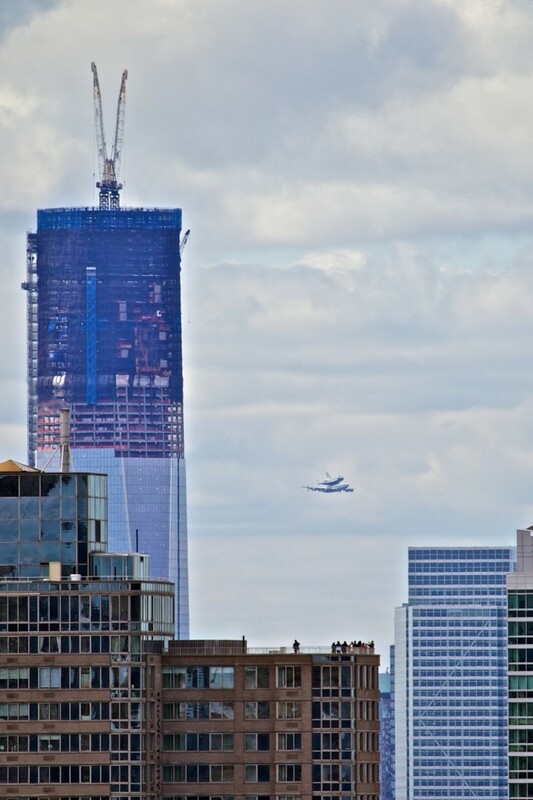 Looking South towards One World Trade Center, someone shouted, “There it is!” With my 400mm lens up to my eye, I confirmed the unmistakeable site of a space shuttle riding atop a jumbo jet. “That’s it for sure,” I exclaimed. Moments later, the Enterprise was flying North along the Hudson River at less than 1,000 feet, headed straight towards me. I snapped away and held my breath as the Enterprise flew just a few hundred feet in front of me. It seemed I could reach out and touch it… or hit it with a spitball. About 10 minutes later, after turning around at the Tappan Zee Bridge, the Enterprise flew South along the Hudson directly in front of my building a second time! The only thing louder than the howling wind were the sounds of the cameras clicking away. I was surprised at how quiet the jumbo jet was flying past. The Enterprise vanished over lower Manhattan, only to reappear traveling Northwest over New Jersey. I noticed for the first time it was accompanied by what appeared to be a single F-18 Hornet (a fighter jet). I thought to myself how odd it was that the Enterprise was escorted by a single fighter jet; don’t these things fly in pairs? I look forward to June when the Enterprise is brought to the Intrepid on a barge and is lifted by crane onto the flight deck. What is so spectacular about this story is that I have the perfect view of the Intrepid from my apartment, so day and night, rain or shine (but not severe fog), I will be able to see the Enterprise staring back at me. It serves as a reminder of the dreams of space travel I often have that I fully believe will be realized one day. 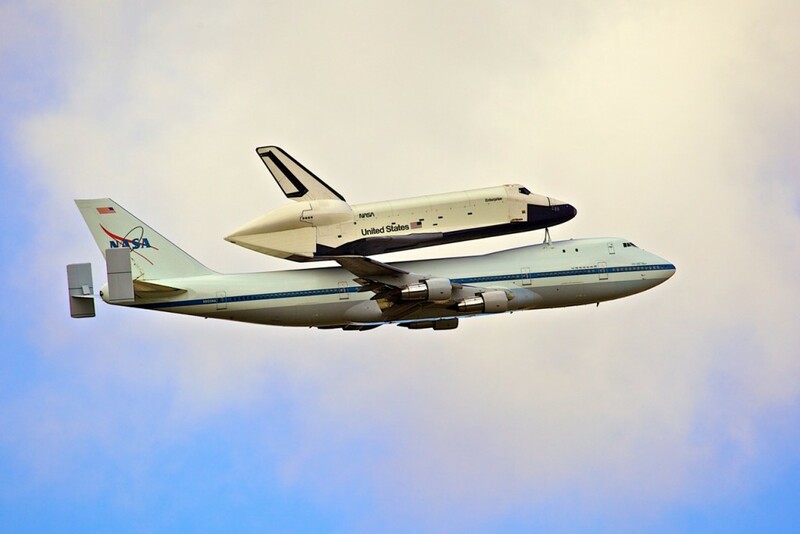 The Space Shuttle Enterprise atop NASA’s Boeing 747 Shuttle Carrier Over the Hudson River. (4/27/12) New York, NY, USA. Canon EOS 5D Mark II. Canon EF 100-400mm. ISO 200. 400mm f/8 1/1000. © Adam Scott Wandt. The Space Shuttle Enterprise atop NASA’s Boeing 747 Shuttle Carrier Flying Past One World Trade Center – The Freedom Tower. (4/27/12) New York City, NY, USA. Canon EOS 5D Mark II. Canon EF 100-400mm. ISO 200. 400mm f/8 1/1000. © Adam Scott Wandt.